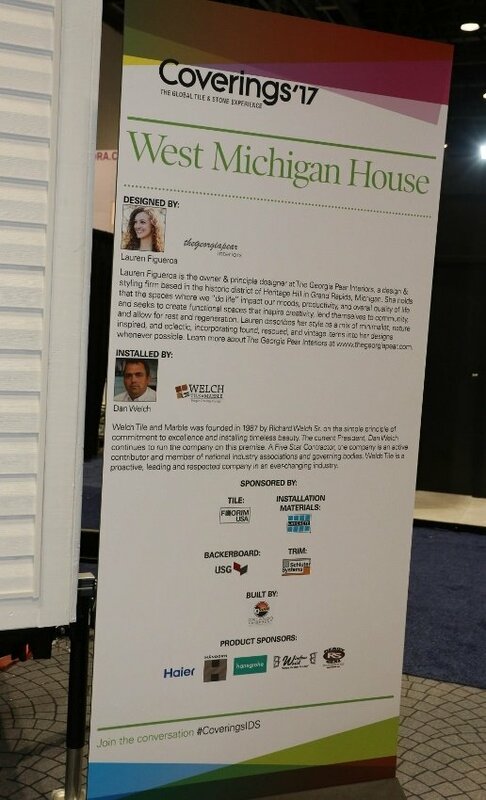 That's what Dan Welch from Welch Tile & Marble and Lauren Figueroa from The Georgia Pear Interiors did during the Coverings 2017 Installation Design Showcase. 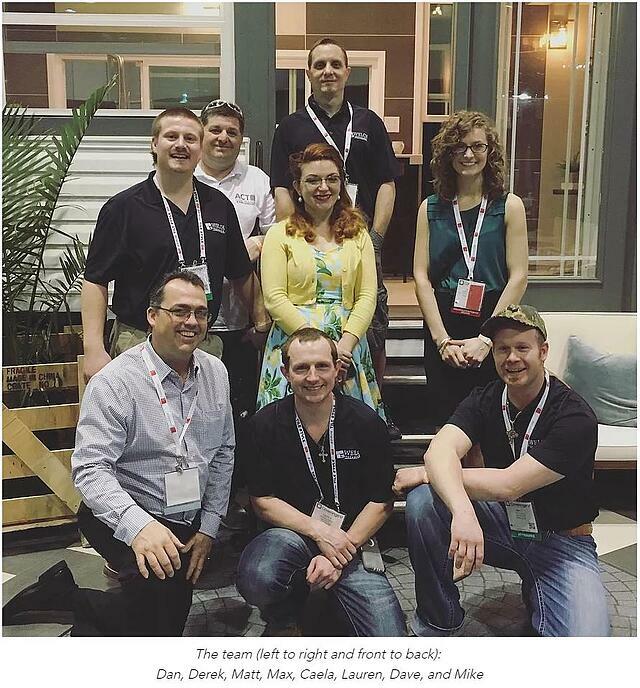 They were one of three groups participating in the live installation of tile in three tiny houses on the Coverings show floor. In this case, the team completed the West Michigan Tiny House. We caught up with Dan to ask him about his tiny home experience while participating in the Installation Design Showcase. CTEF: Dan, could you share some background on Welch Tile & Marble? DW: Yes. Welch Tile & Marble is a second-generation tile, stone and terrazzo installation company based in Kent City, Michigan. 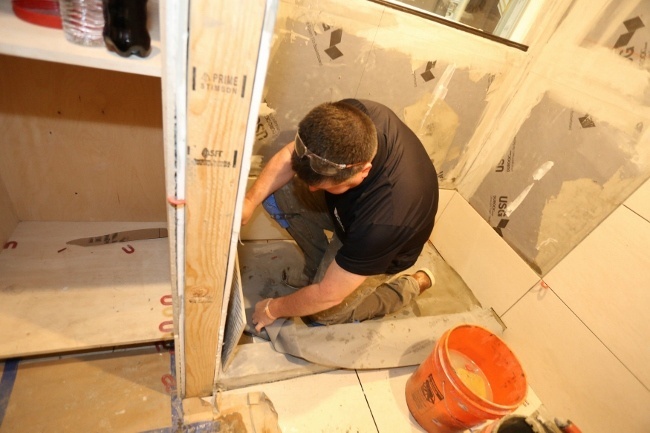 We pride ourselves on our tile installation workmanship. We are a NTCA 5 Star Contractor; we encourage and actively support our employees becoming Certified Tile Installers (CTIs). In fact, we use the CTI program to determine installation strengths so we can better support and educate our staff; it's part of the apprenticeship program we've put together. We're also very active in the tile industry's organizations. 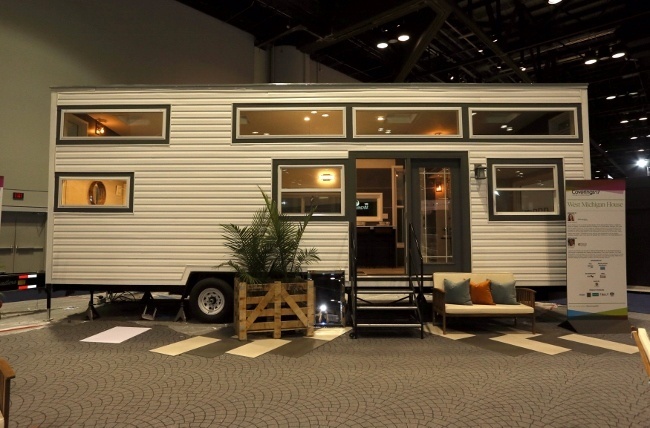 CTEF: How did the Tiny House concept for the Coverings Installation Design Showcase happen? DW: We've participated in several Installation Design Showcases. We did the very first one in Orlando in 2010, then again in 2011. In 2016, we tried something different with our installation. Rather than simply build the vignette at Coverings and then see all of the work and materials go into a dumpster at the end of the show, we decided to build it in a shipping container so the installation could live on and serve multiple purposes. It's currently in the parking lot of our Kent City, Michigan, showroom. We use it to educate about large gauged porcelain tile panels as well as during job fairs to inspire the next generation of (certified) tile installers. Based on that experience, I brought up installing tile in a tiny house instead with Elena Grant from Taffy Productions/Coverings for the 2017 Installation Design Showcase and here we are. CTEF: How did you connect with Lauren Figueroa? DW: My wife, Doreen, contracted with Lauren to work on our home and I felt she was a good candidate for the IDS. My wife had researched Lauren and her company online; she was impressed with her website and portfolio and even more so with the work she did for us. CTEF: Dan, don't you own a tiny home, too? DW: Yes, I do. I found it at a show. It's on my property and David Rogers, who participated in this IDS, lives in it during the week. It definitely offered all of us perspective on collaborating in a small space, not to mention how important it is that every square inch function as it should. CTEF: Who from Welch Tile was involved in the project and how? DW: As I mentioned, Doreen Welch. Caela Maninen, my showroom designer, worked very closely with Lauren. Even during the installation, she and Lauren were busy painting trim and managing details on last-minute changes. Steve Coates, our COO, and Marty McVicker, who is responsible for Warehouse Tool Repair, played impotant roles. On-site Deric Denny, Matt Ford, Max Benton, Dave Rogers CTI#1029, Mike La Count CTI #74 and myself were intensely involved in the tile installation. 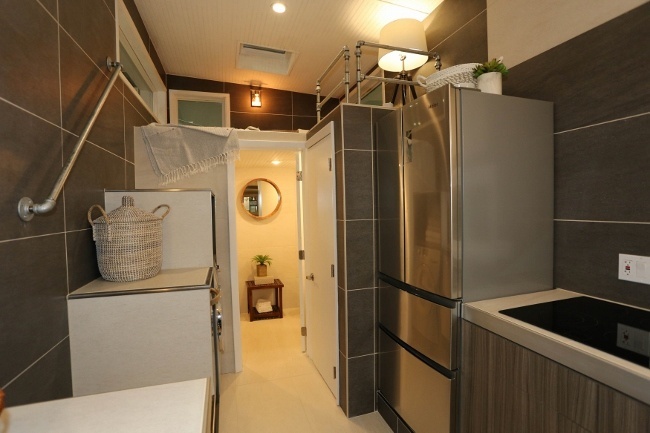 CTEF: What tile products did you install in this tiny house? 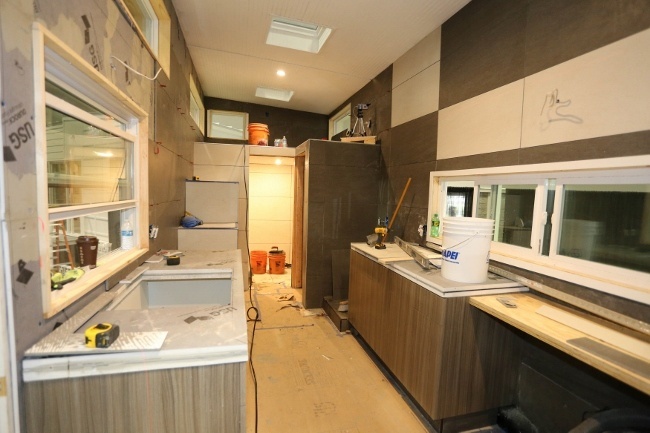 DW: For tiling this tiny house, we used 18x36 tile from Florim USA products, USG backerboards and foam shower unit, Schluter transition metals, and Laticrete setting materials. DW: Coordinating with the builder of the tiny home was definitely challenging. He was located in Orlando and was building three structures for Coverings at the same. We were in West Michigan and had a lot of built-in elements, such as cabinetry, to coordinate. Also, our West Michigan tiny home had 15 openings in the structure so there was a lot of cutting of tiles to work around those openings. We had to miter corners, use a lot of trim. It also included two lofts and used a lot more tile than the other IDS tiny houses. Finally, the structure had to work since it would become an AirBnB after Coverings was over. So, we needed to ensure that plumbing and electrical fixtures would work and could be successfully hooked up later on. CTEF: Dan, were there any last minute changes? DW: Oh, yes! We originally planned for a 33' x 8' trailer. Unfortunately, that became a 30' x 8' trailer very late in the process and meant that we had to make changes and adjust the overall layout. 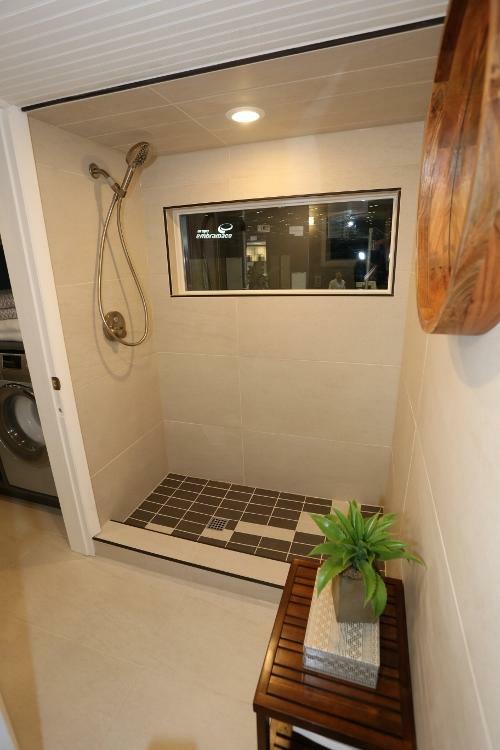 We had to use a different shower entry; the counter height was changed last minute because of the cabinetry height. We also discovered some structural issues that we had to address before being able to tile the tiny house. >> See How to Deal With Tile Installation Problems? That said, despite all those changes, our West Michigan tiny house came out beautifully! CTEF: How did the pre-planning differ from previous IDS projects? DW: The biggest difference between this project and past IDS projects is that this wasn't just a tile installation. It was a construction project. We essentially were general contractors on the project. As with all projects, there was lots of pre-planning. That's what enabled us to deal successfully with all of the last minute challenges. DW: We had three CTI and three future CTI installers on-site and involved in this project in addition to Caela and Lauren. Their knowledge and expertise were instrumental to completing the West Michigan tiny house on time. It truly took a strong team of talented individuals to pull off this build which started late Friday afternoon, and finished Wednesday night. That's only 5 days to fix many issues we faced with the structure (e.g., studs missing, out of plumb walls, electrical and plumbing missing) and install wall and floor tile in a tiny house. Then, we needed to install the seating and the cabinets, finish the trims, the stairs and the railings, and install the cook top, the dish washer, the washer/dryer and the refrigerator. Finally, we needed to change the interior doors last minute, create extension jambs and cut, paint and install a lot of trim. CTEF: Thanks very much, Dan, and congratulations on a beautifully built and tiled West Michigan tiny house! In case you missed Coverings17, you can watch the Welch Tile & Marble and Georgia Pear Interiors team in action in this IDS Build: West Michigan House 44:42 minute time lapse video of the installation. Let us know what you think of the West Michigan tiny house in the comments.